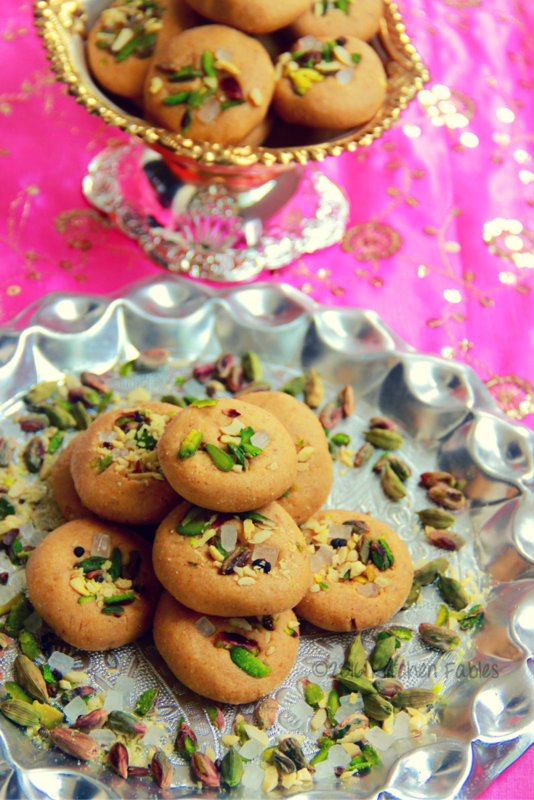 After Parwal Ki Mithai I thought of penning down a recipe of another lesser known sweet from Uttar Pradesh – Magdal. 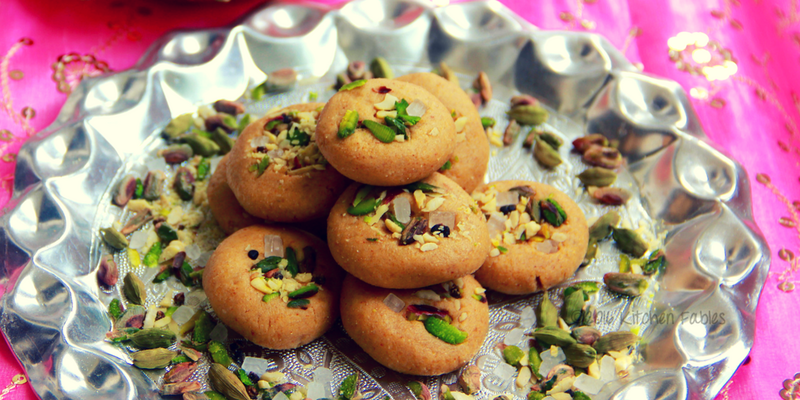 Magdal is a speciality from Varanasi. Magdal is made from Moong dal and Urad dal flour and Desi Ghee ( Clarified Butter ). I first had this sweet when my Father was posted in Varanasi. Varanasi is known for the Ganges river , Temples and also it’s food. 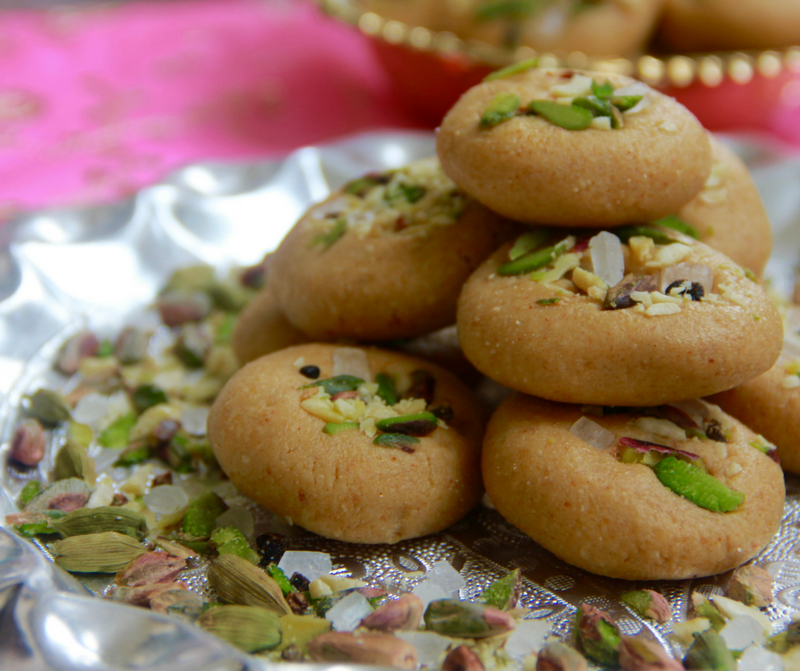 The variety of sweets in Varanasi and their taste is something one must explore when visiting the city. Magdal is made without any milk or water and therefore has longer shelf life. My mother used to make it during Diwali to gift it to friends and family. Over the years the tradition of making sweets at home has almost vanished, by writing down these recipes and showing how easy it is, I am doing my part to see this tradition revived. It is better to make the simple sweets at home and enjoy them with family and avoid the artificial flavours and colours being used by the restaurants and sweet shops. Magdal flour should be preferably made at home or if you are buying from market add a table spoon of coarsely ground moong and urad dal to get the crunchy texture. The dal flour should be roasted on a low flame to ensure even cooking of the flour. Another important step is to whip the roasted dal. The air incorporated through whipping makes the magdal soft. In a dry grinder, powder moong dal and sift it. Take the contents remaining in the sieve and grind it again. Now sift this and repeat the process 2-3 times till you are left with only a tablespoon of coarser dal left in the sieve. Repeat the above process with Urad Dal. In a heavy bottom pan heat ghee and roast the dal powders. Roast on slow flame for about 30 minutes till the dal powders turn golden brown. Switch off the gas and let the dal cool down. When the dal has cooled down to room temperature, whip the dal for 15 - 20 minutes or till the colour of dal becomes light. Add powdered Sugar to the dals and mix well. Make small balls of dal mixture and put a little pistachio mixture on top, Press the ball between your palms to flatten it. 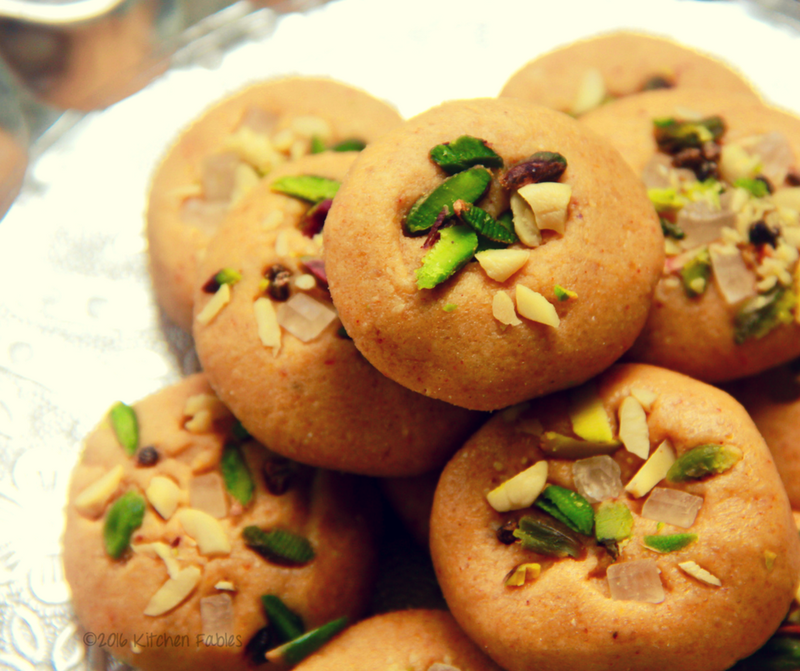 This one’s new to me, I have a lot of indian sweets to learn. Thanks for this one. New to me too! And I thought I knew most of the dishes from UP! Thanks, Paluk! Thanks Teena, Sundari & Sujata !!!! Magdal is now available in many cities of UP but is very popular in Varanasi. In fact, in Varanasi the flour with an appropriate ratio of coarse dal is readily available !!! Thanks Nadita. Whip it with a spatula. Do let me know your feedback when you make it.